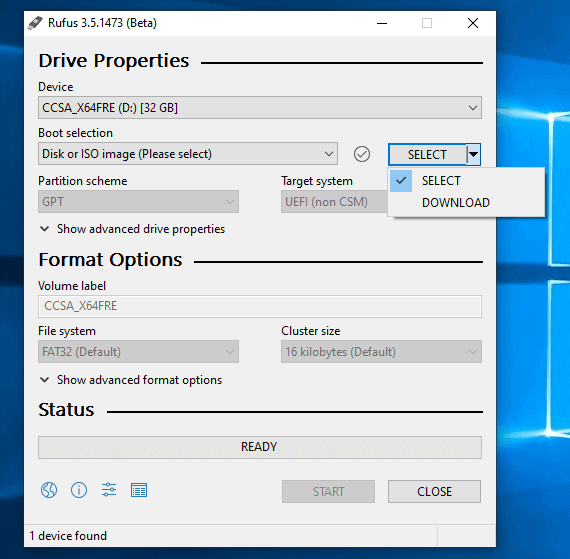 The Select button in the program interface features a small down arrow icon that you may activate to switch between "select" and "download" when "Disk or Iso image (Please select)" is selected under "Boot selection". If only this had an option for Windows 7 ISO download, it would’ve been a beast. Please don’t ask for support regarding Windows XP or Windows Vista installations, or even regarding running Rufus on Windows XP or Windows Vista, these platforms are no longer supported. I asked them just that question, but they did reply….. Sorry, TotalBuzzKit, I forgot to leave “/s” at the end for you. Last version that works for Windows XP and XP x64 is version 2.8. I just tried 2.18 and it worked in XP x86 sp3. At least it opened correctly while 3.4 did not. I don’t have a flash drive to actually test it but it did load. Great little idea and option. Hopefully Linux is included as well but there’s so many distributions, where to start? 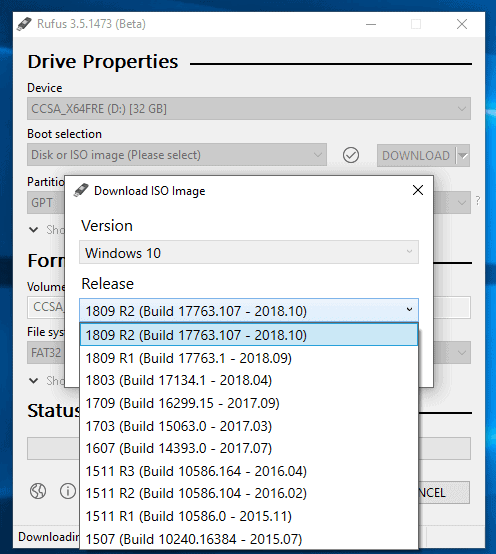 Finding Linux iso images manually is also significantly easier whereas getting Windows images is not so easy so it makes sense to prioritize this. You need to have ‘Check for updates’ enabled in the Rufus settings. Because the ISO download feature requires the execution of a remote PowerShell script, which people might have an issue with, Rufus considers that if you don’t have ‘Check for updates’ enabled, you also don’t want remote scripts to be executed, and therefore it disables the feature. Also, the feature will not be proposed unless Rufus has been able to validate that it could reach the remote script during launch, so if there was any issue with your network (or if you are running Rufus in an unconnected environment), the download button will not appear.